Along with co-founder George Imafidon, third year Civil Engineering student Muizz Almaroof set up Motivez, an events platform to inspire productivity among young people, in 2014. During his first year at LSBU, Muizz was also accepted onto the University’s Spark programme, a six-month programme for students who want to turn their ideas into a business while they study. Motivez continues to use the space at the Clarence Centre. These events are based on education, networks or seminars and any other form of useful information young people might need to help make their pathway towards their career goal smoother. Motivez is a mobile application and website service, with bespoke workshops organised on specific interests to educate young people, while school visits also take place to advise teachers how they can work more closely with young people who are having difficulties with the educational system. 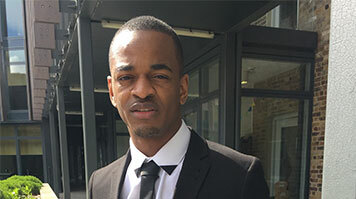 Muizz reveals that he saw LSBU’s Spark programme as an opportunity to really get to know himself and to further develop Motivez on a much more professional level. “The programme really helped us fill in the missing pieces of information that we needed to know about starting up a business. The benefits of this are huge, from gaining some great networks to working with great people who truly believe in the vision and learning and taking on some new ideas to help establish our business successfully. With Motivez continuing to use LSU’s Clarence Centre as office space, how beneficial does Muizz think it is to be able to access space such as this and other support/facilities at LSBU?